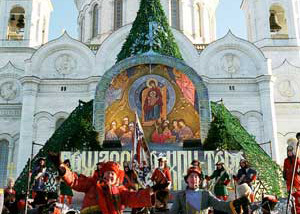 Orthodox Christmas day in Russia falls on January 7th each year and celebrates the birth of Jesus Christ. People spend the day with friends and family enjoying a meal together and many go to church. This is a national holiday with most government and businesses closed. The Bolsheviks banned Christmas and much of the traditions of Christmas were moved over to New Year's Day like decorating tree, and gift giving. In 1991 Christmas Day became a national holiday with growing support from its leaders and the people to have such a holiday.